Data is a field that branches off into many specializations, something that's made all the more confusing by employers who are unsure of how to properly define the data roles that are available. This potential overlap of responsibilities is why it's a good idea to understand how the three major data-centric occupations (Data Analysts, Data Scientists, and Data Engineers) differ from one another. Rather than try to describe each occupation type here, we've chosen to dive into each one in-depth on our blog — we encourage you to do additional research on the role(s) you find interesting after you've read the article in order to make an informed decision about which occupation to pursue. Well, because we've designed our learning paths around four categories! We have three paths that are named after the occupation types we mentioned above — each path covers all the concepts you'll need to learn in order to start tackling your own end-to-end projects, and, hopefully, competing for entry-level data positions. We've added some brief summaries of each path below. This path teaches the essential skills you'll need to start pursuing entry-level jobs in data. These skills are python programming, data analysis & visualization, working with the command line, databases, APIs, web scraping, statistics and more. These skills are R programming, data analysis & visualization, working with the command line, databases, APIs, web scraping, statistics and more. This path covers the skills you'll need to make valuable predictions using Machine Learning algorithms. This path includes all of the Data Analyst in Python path since data scientists rely on these skills as well. In addition, this path includes Machine learning courses and goes into more depth in areas like linear algebra and other advanced topics. This path teaches you how to build data pipelines to work with large datasets. It currently covers processing large datasets in pandas, optimizing code performance, and how different Data types can help speed up your analysis. This path is relatively new, and we're releasing it in an iterative rollout (i.e. we add new courses as we complete them). Data Analyst in Python - Learn how to manipulate and analyze data using Python. Data Analyst in R - Learn how to manipulate and analyze data using R.
Data Scientist in Python - Learn how to make inferences and predictions from data using Machine Learning. Data Engineer - Learn how to build data pipelines to work with large datasets. Remember that the most important thing here is that you make a decision and just get started. It's easy to change learning paths on our platform if you decide that one or the other is a better fit for you, and since the progress that you make transfers across all of our paths, you're not wasting time by tackling one or the other. What plan you pick will depend entirely on the learning path you've chosen for yourself. Access to 30 various missions, including the entire Python Beginner Course. Access to all courses and missions in the Data Analyst path. 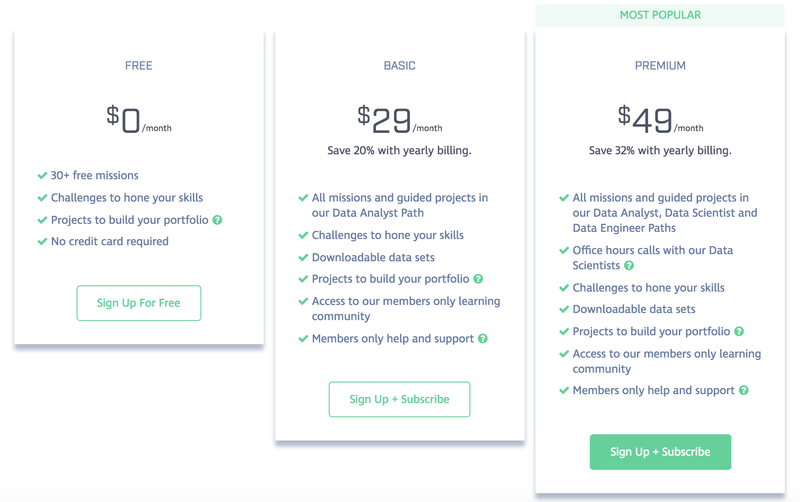 Access to all courses and missions in the Data Analyst path, Data Scientist path, and Data Engineering path. Access to our Q&A student forums. Everything in Free plus priority support and access to our members-only Slack community. Everything in Basic plus access to 1:1 Office Hours with our DS team for career advice. N/A N/A Resume reviews and interview prep via 1:1 Office Hours with our DS team.